Billionaire Investors are Selling Cisco Systems Stock; Should You? The IT bellwether's core routing and switching sales are under pressure, but does that make the stock worth selling? It's always a good idea to track what leading investors are doing on a quarterly basis. Investors in Cisco Systems (NASDAQ:CSCO) likely won't be pleased to hear that two hedge funds founded by billionaire investors (Moore Capital Management and Tudor Investment Corp.) reduced their positions in the last quarter. While I don't believe in blindly following billionaires, their moves give investors cause to consider whether the stock is worth continuing to hold. Let's take a closer look at the buy and sell cases for Cisco Systems stock. Cisco Systems keeps corporations connected. Image source: Getty Images. History is littered with former stock market darlings that disappointed investors, and the key causes are usually a fundamental decline in the company's core end market. Cisco is best known for its IT hardware -- switches and routers that provide the backbone for business communication -- but these products (responsible for around 45% of its fiscal 2016 sales) are facing two existential threats. First, increasing use of network virtualization could result in reduced sales of Cisco's switches and routers. If a corporation is managing its network using software in the cloud, then it's less likely to need Cisco's expensive switches. Second, if network virtualization leads to the usage of less sophisticated routers and switches, then Cisco's market position could come under threat from competitors like China's Huawei or ZTE, particularly in emerging markets. 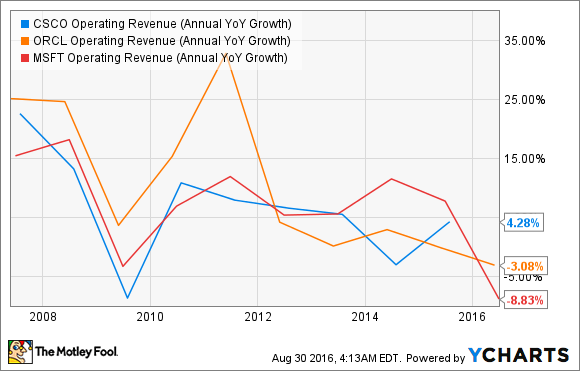 Indeed, a quick look at Cisco's switching and routing revenue growth shows the stagnation in switching and routing sales in recent years. Data source: Cisco Systems presentation. Chart source: Author. All told, the bearish case highlights the risk of long-term decline in Cisco's core end markets. Given Cisco's patchy record of making acquisitions in non-core areas -- previous CEO John Chambers hardly covered himself in glory with the acquisitions of Scientific-Atlanta, Pure Digital Technologies and Tandberg -- doubts exist about whether the company can successfully use its cash to reposition itself for future growth. Investing isn't only about buying a well-run company, it's also about buying a company at the right price, whether it's well run or not. In this line of reasoning, Cisco is an attractive stock. There are three key arguments for buying the stock. First, as you can see below, the company remains a prodigious generator of free cash flow. Moreover, the price you pay for the stock -- measured by enterprise value (market cap plus net debt) of 9.67 times free cash flow -- looks cheap. 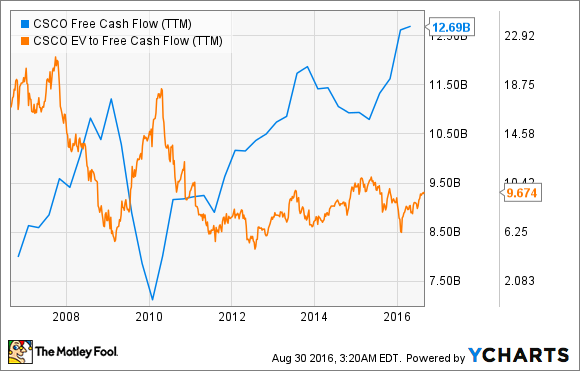 CSCO Free Cash Flow (TTM) data by YCharts. To put this into context, Cisco is currently generating around 10.3% of its enterprise value in free cash flow; theoretically, it could use this annual cash to make acquisitions and buy itself into future growth. CSCO Operating Revenue (Annual YoY Growth) data by YCharts. Analysts have the company growing revenue at 1.1% in the current fiscal year, with 2.9% forecast for next year. In other words, Cisco's revenue growth is expected to keep track with inflation, while free cash flow generation remains significant. Moreover, Cisco's stock comes with a current dividend yield of 3.3% -- not bad when compared to the current U.S. 10-year Treasury yield of just 1.6%. Third, the company is undergoing a transition toward being a more software- and service-oriented business. As a recent analysis of Cisco's earnings shows, its reported revenue growth is not entirely demonstrative of the company's growth; moving toward a software and subscription business model usually entails shifting upfront product revenue toward longer-term recurring revenue. Meanwhile, management announced plans to cut costs by downsizing the workforce in response to low growth in its core businesses, as its emphasis shifts toward investing in Cisco's faster-growth, non-core businesses. Are the billionaires right to sell Cisco stock? No. While Cisco's switching and routing growth looks challenged, so far, it doesn't look anything like the precipitous structural decline suffered by, say, HP's printer business. After all, corporations will still need communications networks, and need to replace existing networks. Meanwhile, Cisco has the cash reserves and current cash flow to buy its way to growth. Chambers' track record of acquisitions may be uninspiring, but current CEO Chuck Robbins should be given the benefit of the doubt. All told, I think Cisco's cash generation and dividend make it worthy of a position in a diversified portfolio for value-oriented investors -- just keep an eye on its switching and routing businesses.